In the fall of 2017 Johalla Projects partnered with Victoria Press and the Chicago Athletic Association hotel to present Art Shoppe, a temporary pop-up art shop located in the hotel's lobby. 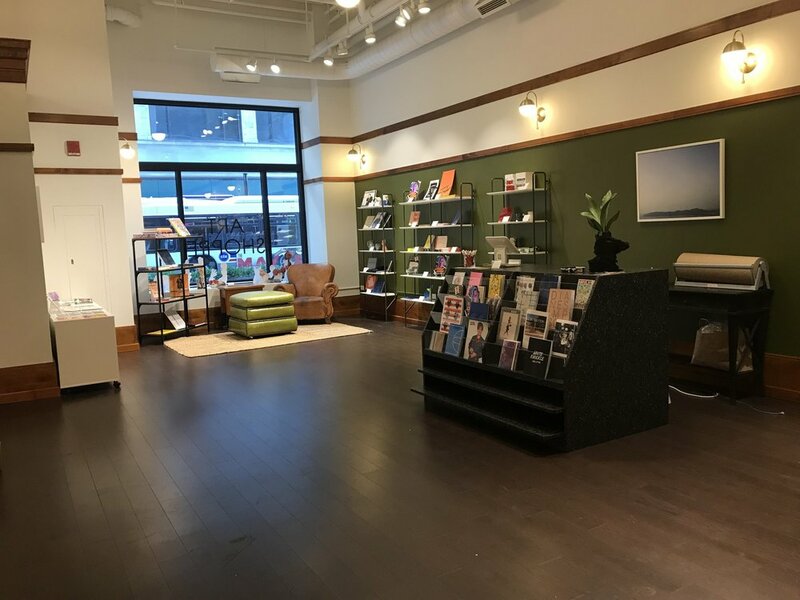 Art Shoppe offered a new platform from which to expand an art-book library, acquire accessibly priced artworks, and understand the pulse of contemporary art discourse. Art and literature are long-standing collaborators, with artists pushing their work into book form and writers utilizing words to consider art throughout history. Art Shoppe celebrated that partnership and offered a commercial space for literary and artistic immersion. The pop-up shop was filled with zines, exhibition catalogs, and artists’ books alongside editioned prints, original artwork, records, and ceramics. Installations by innovative artists like Hidden Folk and Stephen Eichhorn were interspersed throughout the shop. Johalla Projects is a proud partner of the Chicago Art Book Fair (CABF) and Art Shoppe was made possible by CABF’s support. CABF curated a special selection of books and artworks that were on display. Art Shoppe also brought books from arts organizations and galleries across Chicago and New York into one space. Participating organizations included Corbett vs. Dempsey, LVL3, Candor Arts, the Donut Shop, and Anton Kern Gallery. Records from Reckless Records were also available. Art Shoppe included a “gallery wall” dedicated to exhibiting artists from Johalla Projects’ exhibition program. Marzena Abrahamik and Clay Hickson were the first artists featured. Each month new artists were exhibited, creating an evolving space for viewing contemporary art. Art Shoppe offered the opportunity to interact with artworks, publications, and editions.